Some smaller open wounds can be taken care of immediately without putting the bird through the unnecessary stress of going to the vets. The information on stitching is provided since we have heard from smallholders and very experienced poultry keepers who have stitched wounds themselves but again, this is really for a vet to take care of and decide on whether it would be better to leave the wound open to heal (see open wound healing process below). 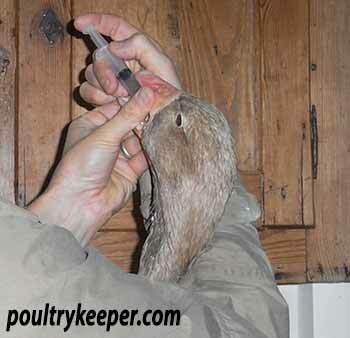 A bird will stand a much better chance if a vet treats the wound and administers antibiotics if necessary. Hold a clean piece of lintless cloth or gauze over the wound. Trim feathers away from the edge of the wound. Wash the wound with warm mild soapy water. This can be un-perfumed hand soap. Rinse well with clean warm water. Trim away any loose bits of skin that will not heal. Apply antibacterial ointment daily to help keep the wound free from bacteria or, if the wound requires stitching, read on. If an open wound is ‘gaping’, is deep, or has had large patches of skin removed, stitches are usually required and you should really seek the help of a veterinarian! Stitches should go through the skin but no deeper than 1mm. They should be sewn 3mm apart and pulled taut. 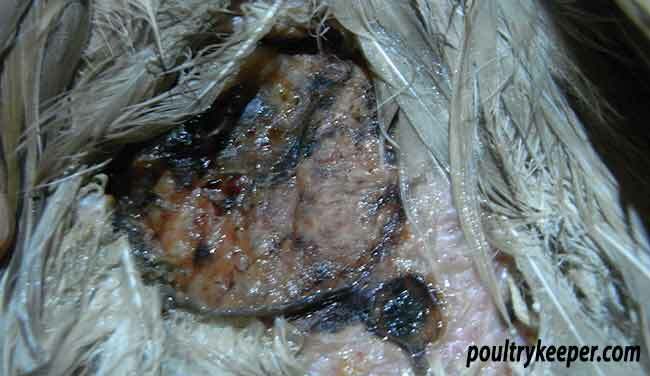 The skin should be pulled together but not so tight that the skin puckers. Stitches should be cut and pulled out in 4 to 5 days. An antibacterial ointment can be applied daily over the surface of the wound to keep it free from bacteria. Sometimes the skin is torn and there is an open wound, but your vet will not stitch it up. If bacteria gets into the wound (for example as happens with a fox / dog bite) then stitching will make matters worse as it will trap bacteria inside and cause infection. One of my geese was bitten by a dog. The skin was torn and there were a number of puncture wounds from teeth. The vet decided the wound should be left open to heal. In this case, the wound needs to heal from the inside – out. To do this, you will need to keep the surface of the outside of the wound moist and clean by squirting saline solution (from your vet) over the surface twice daily. A few days later. The wound was left open after I kept it moist with saline twice daily. It reduced in size and healed up after a couple of weeks . If the bird is in shock after its ordeal, your vet will probably prescribe a pain-killer to help the recovery process. Metacam for example, used for cats and dogs may be prescribed by your vet and you can then continue to give this orally at regular intervals with a syringe over the course of a few days. This is one of the most important things for bad wounds. 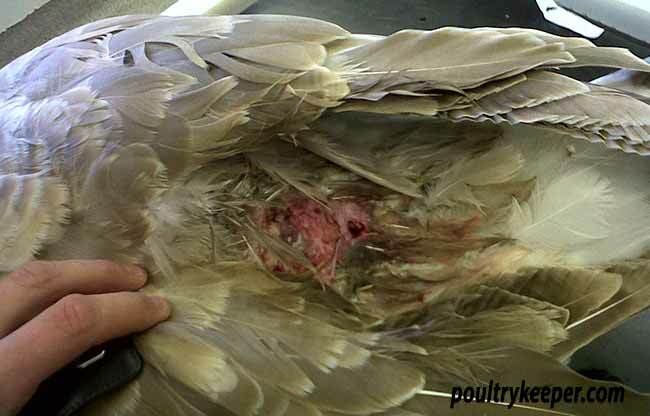 Most skin tear wounds will heal – if the bird dies, it will usually be because of infection getting in, so the sooner you can get the bird to a vet to get some antibiotics prescribed, the better. Ask your vet about injecting antibiotics such as Tylan or Baytril. Amoxypen, another broad spectrum antibiotic that is long-lasting is also sometimes injected and tackles a different set of bacteria. A course of Tylan soluble or Baytril Oral can also be continued at home if your vet decides to prescribe this too. By the way – the goose in the pictures made a full recovery!